It detects small flow rates. Since this flow meter uses magnetism, it can measure small flow rates with high precision. 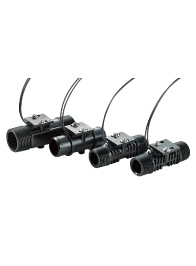 A variety of models are available for many flow rate ranges and connection diameters. The mechanism is made of Noryl so it is rust proof and corrosion resistant. The housing is leak free, made as a one-piece molding. It offers high reliability; no springs are used. The mechanism is rust proof and corrosion resistant. Disconnects the cleaning water in a cleaning unit. Cooling water for diesel engines, semiconductor production facilities, colorant monitoring, such as water glycol mixtures, pure water, and fluorinert. Assessing clogging in distilled water filters. Prevents running a pump dry. Monitors gas flow rates including air, and N2. A lead switch is integrated above the switch body, and a bias magnet is integrated at its bottom. A magnet is integrated inside the flapper. When a liquid flows at the maximum flow rate, the flapper is pushed and raised. The lead switch is closed by the magnet inside the flapper, and the contact points output signals. When the flow rate drops, the flapper starts to lower by its own weight and reduce the magnetic flux in the bias magnet. The lead switch opens at a specified flow rate and the contact point is disconnected. By changing the magnetic flux in the bias magnet, and finely adjusting the lead switch position, you can set the flow rate and maintain the precision you desire.